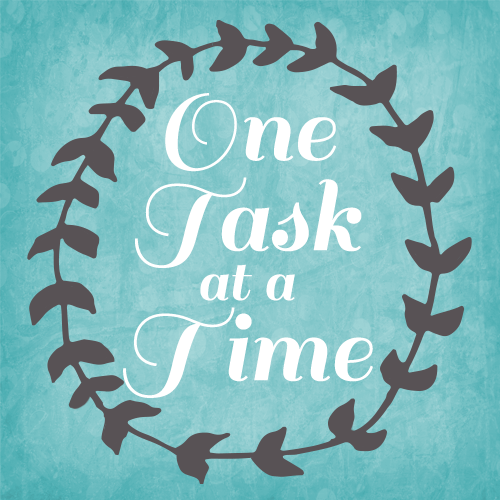 aside	One task at a time. I am envious, sometimes, of those people who have a path to follow through life, while I jump from stepping stone to stepping stone, never able to see more than a step or two in front of me. I am envious, sometimes, of those people who have crystal clear clarity – who know what they want, where it is and how to get it, while I peer into the foggy future and see dim outlines and misty maybe’s. When I pray for guidance, I am told do the thing right in front of you. When you have done that thing, the next thing will make itself known to you. Do that. When I say, But what if I don’t know what the next thing is? What if there are 4 or 5 next things and I don’t know which one to choose? Or worse, what if there is no next thing, and I can’t see anything in front of me, only the stepping stone upon which I am standing? And then I am told, Look around you – does anything need to be done? Go do your work. Clean a long-neglected cupboard or oven. Call a loved one you haven’t spoken to in too long. Go for a walk and notice the sun shining through the thin lacy branches of a wintry tree. Nourish your garden.Take some time, stare at the sky, meditate and do yoga. Help someone. So…I take the dog for walk, take a friend out for brunch, clean two terrible kitchen cupboards – and the oven omg :). Clean out the vegetable garden ready for mulching, ring my Dad and an old friend, do yoga and meditate. I cook, I clean, I write, I wash clothes, I play with the kids. Perfect means exactly and completely how it’s meant to be. Why do I put off cleaning cupboards, fridges and ovens so very long? I love clean cupboards! Previous Because I’m the Mum. love this post 🙂 happy two years to you! Why thank you! It was quite a surprise to me, but it’s started me thinking about how much my life has changed over the past two years since starting to blog. It’s been quite an amazing journey actually! Hi Lillian, thank you 🙂 The thing is, I do know – except for those times that I don’t. Mercifully, those times are becoming shorter and shorter before i wake up and remember!